The Plant Variety Protection and Seed Act provides the plant variety registration system for protection of plant breeders' rights to promote breeding new varieties. Japan is a member state of the International Union for the Protection of New Varieties of Plants (UPOV), an international organization aiming to protect new plant varieties, and operates its plant variety protection system in harmonization with other member states.Under the plant variety registration system in Japan, NCSS conducts DUS (Distinctness, Uniformity and Stability) growing test to provide data to clarify whether candidate varieties are new ones or not for the examination by Intellectual Property Division of Ministry of Agriculture, Forestry and Fisheries (MAFF).In DUS growing test, candidate varieties are cultivated on fields or in greenhouses and compared with similar existing varieties (reference varieties) and morphological characteristics (colors, shapes, size, etc.) and physiological characteristics (tolerance to diseases, etc.) are evaluated. Distinctness: New varieties should be clearly distinguishable from any other existing varieties. Uniformity: Individual plants of new variety should be sufficiently uniform at the same propagation stages. Stability: Characteristics of new variety should be stable through repeated propagation. Collection and conservation of reference varieties, including standard varieties, and development of their database . Data collection of characteristics of newly introduced plant species/genera into Japan for facilitation of development of new DUS Test Guidelines by Intellectual Property Division, MAFF. The Netherlands Inspection Service for Horticulture (Naktuinbouw) and the Center for Seeds and Seedlings, NARO (NCSS) have established Calibration Manual for DUS test. 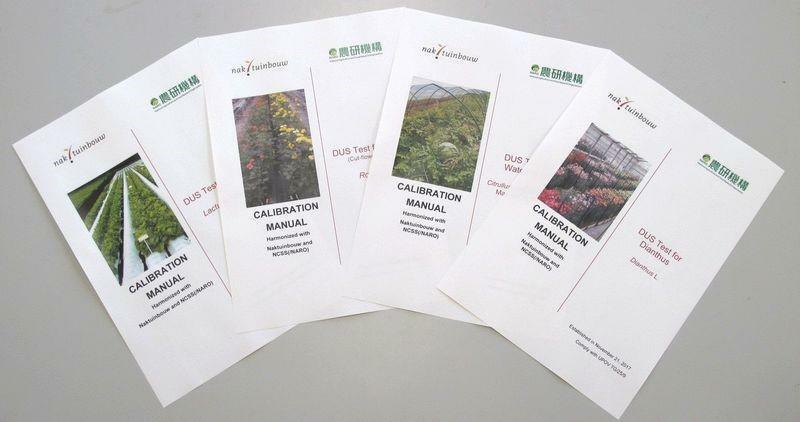 Calibration Manuals, which include many photographs explaining how to observe and measure characteristics of varieties will be easy-to-understand reference material for users from these countries. This joint activity will result in 11 calibration manuals.